Many people have limited space to cultivate their plants, as they have no gardens to till.But they still want and need to grow some of their own food. Yet the absence of a garden with a soil surface is not damning, for even in confined and limited urban spaces there are possibilities for cultivation. It all depends upon how the growers maximize their use of the space available to them. I am fortunate to have land, not a great deal of it, but enough for my needs. but there are others less fortunate than I, people who have crowded little spaces on balconies and in yards. Indeed, if I had not my plot I have only a yard behind my house and a small front space,so I am one of the fortunate ones. First and foremost you need to see the space that you have as an opportunity, so you need to look at it with open eyes, a clear mind and then begin to think. Also important is to realize that gardening is not a "back to nature" activity. Yes, we gardeners do contact nature when we till the soil and cultivate the plants in it, but gardening is essentially an activity of civilization. It is humans interacting with nature to create their own area, the space that they have available, according to their own needs and interests. So a garden does not need to stand on soil, so having a only yard need not deter you. While it needs soil, the garden can use containers. It might contain structures such as greenhouses and frames. These do not need to stand on soil either. Many a greenhouse floor is concrete or flag stones, and, indeed, without a solid base, at least around the walls, many greenhouses would simply be bowled over. Growing is often on benches or in pots, though there are greenhouses in which the crops are grown in soil. Looking at space means looking at more than the horizontal. Vertical growing up walls is a well-established process. Often this is done with fruit trees, which are espaliered to walls [see below] , and plants such as winter jasmine are grown up trellises. But looking at spaces means looking at layers. A shed roof or the flat top of some walls can be an ideal place for pots, though I suggest that some means of fixing them in place is essential to protect from wind and cats. That's an issue in my yard. My very lovely neighbour, an old lady, is a cat lover, and several felines congregate in her yard, and they have a habit of jumping on the wall. I have decided not to put any pots on the wall, victory to the cats! 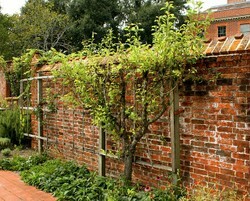 The use of trellises to grow plants is common, and these devices make use of existing walls, but there are other ways of growing vertically . One is to take an existing wall and attach containers to it. These containers can be well-constructed wooden boxes attached to the wall, as you see in the picture below. Containers such as these are very suitable for small plants that do not have deep roots, such as salad vegetables. Some growers, however,go for the DIY route and use home made containers, such as plastic bottles.There are differing techniques. One is to cut part of the side out of the bottles, whereas the other is to cut off the top. The bottles are then affixed to string and hung from the wall. They are then filled with compost and seedlings planted in them. You want to avoid waterlogging if there is serious rain, so some small holes can be made about half way up. Do not over-water the plants, but ensure that the soil does not dry out. As the container is small there is always the possibility of its running out of nutrients, so occasional doses of fertilizer work, but do not over-fertilize, as this can kill plants by causing reverse osmosis, a process that scorches the plants. Small amounts not given too often, say once a week will work. There is also a salad tower, which consists of a drain pipe wit holes cut in the sides. Down the middle is inserted a water tube, also with smaller holes drilled in it.. The drain pipe is then filled with compost and salad seedlings inserted into the holes. Watering is by way of the tube. This sort of cultivation device is useful in gardens and on balconies. If you have a patch of earth you can grow something in it, as long as you tend it well enough. But for many people who have limited space there is only a yard with a stone surface. No matter what size the yard is, it is the surface quality that limits the space. Of course, a courtyard can be the scene of a container garden,whose containers are sizable stone or brick enclosures in which trees can grow. It can also contain large pots capable of taking shrubs. But few of us have a courtyard. For most of those with just a yard, there is the possibility of using containers, but for some growers pallets are an option. 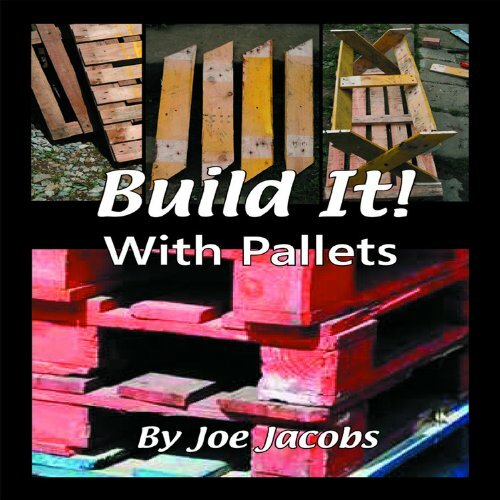 There are two ways of using pallets. You can make a container from four of them knocked together. Often the pallets are cut down in size to make them more manageable, often they are cut in half, as you do not need great depth of soil for many vegetables. The inside of the pallet box will be lined with plastic or geo-textile to hold in the soil. It is also useful to insert water pipes to take water to the depths of the pallet container.An over-spill pipe placed about five sixths of the way up is also valuable, as all containers are prone to flooding in severe rain storms,and this will prevent complete waterlogging. Yet pallets often go with pallet collars, which are flexible, hinged containers fitted over pallets to enclose the goods that they carry. Their uniformity of design means that they are intended to be stacked one atop the other,so many gardeners use them to create raised beds. In the picture below you will see how I use pallet collars on my allotment. Yet pallets can be used vertically. Again the base of the pallet needs to be covered with black plastic or geo-textile, firmly affixed with staples, and the spaces filled with soil. It is then placed on its side,possibly affixed to a wall, and the seedlings inserted into the spaces. Watering can be with a spray. As with all containers the soil nutrients quickly run out, so regular use of fertilizer is necessary, but as I have said before, not in excess.You do not need large amounts. But all containers tend to dry out quicker than the soil does, so you need to keep an eye on their moisture levels. Heavy plants are unsuitable for this vertical growing, so it is better to grow lighter plants such as the great range of salad vegetables that is available. Keep the heavier vegetables for the containers that lie flat on the ground. Using the vertical can be done by having a greenhouse affixed to a wall or standing by one. If you look at the picture below you will see what is known as a grow-house, a small plastic structure. The one that you see is in my own back yard, which you will note is quite small. I am obtaining a second greenhouse for the allotment, and as I am allowed only two of them, and as there are no walls on the allotment to which I can affix the grow house, I keep it in my yard and use it for growing on seedlings. This little structure is safely stacked against a wall, and has never moved despite any of the strong winds that have beset Britain in the past few years. It allows for vertical growing on its several shelves. As you can see from the picture below it is possible to construct a trellis for certain fruits such as grape vines, apricots, peaches and nectarines. You need a suitable climate for plants like these, but if you manage to get it your small space can be a replica of the Mediterranean, a sunny spot dripping with rich fruits. Be careful to keep them well sprayed with water and to have netting to protect against predatory birds. I speak from the experience of dealing with Britain's ruthless foragers, wood pigeons. Suppose though that you want a tree and you only have a small space.There is a solution. You can go for a tree on dwarfing root stock and espalier it, as I said earlier. How does this work? Well, the fruit trees that you see are rarely grown from seed, but they are the product of vegetative propagation. With trees this involves the grower planting a root stock and grafting a branch from the variety of tree from which they want fruit. The root stock determines the eventual size of the tree, so if you want a small tree you ask for one grown on dwarfing root stock. Then you select the variety that you want. The next step is to make an espalier. The way to do this is to affix steel lines to the wall, a few centimetres off its surface. You can do this with special screw-in bolts that have eye holes large enough for steel lines at their head. Then you plant the tree below the lines. As the tree grows you train it to a fan shape, leading branches in the desired direction by affixing them to the wire and pruning off any that are not growing in the desired direction. The espalier that you see in the thumbnail sketch is not the best example of one, as it is too bushy, but a well done espalier is like a fan. You need to maintain your espalier by careful pruning, so it pays to learn that particular skill. It is better to plant the tree in Earth rather than in a pot, as trees in pots soon become root bound and weaken, and while some trees can be re-potted, an espalier cannot be, as it is affixed to its wires and wall. So planting in Earth gives room for its roots to grow. To do this you could take up some flag stones or make a rather large wooden box and fill it with soil for the roots to be planted in. When you see a plant growing in a crack in the pavement you realize that life will find its space anywhere, it will surge up in the most unlikely places. Ideally, we might want a farm or a large garden, but a small garden is perhaps the most challenging of projects. Making the most of a little, now that's a true gardener. Thanks for sharing these handy tricks. Pallets break down and decay with time.I found this out when I laid a pallet as the basis of a compost heap. The air flow accelerated decay, but the pallet broke up. frankbeswick, Thank you! The pallets are so attractive because of their practicality in being recyclably compostable and their rustic looks. 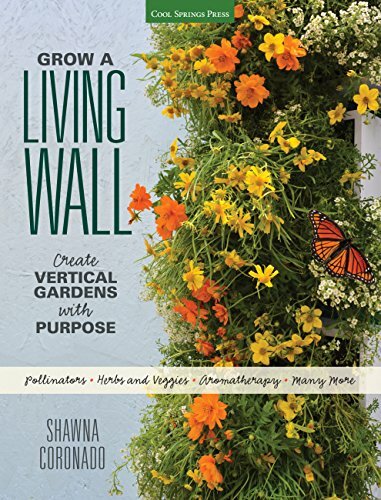 The vertical options draw me because I love the way your "living" wall images look and I like the olfactory, textural and visual appeals of espaliered and pergola plants. The salad tower sounds immediately doable since there are two drain pipe segments that no longer do their job and need to have their purpose redefined. Gardeners as artists! Absolutely right. I like the comment about the human need to create their own areas. I believe we could then say gardeners are artists, for those areas, while not in the usual sense, can become a form of art. I also like the inclusion of vertical gardening. Pallets are often treated with preservative, but unless re-treated or painted they will rot in the end. I did find that using pallets to make the base of a compost bin makes them rot quicker than most other pallets do, as the chemical activity of the compost process makes them rot. I always enjoy reading your gardening pages Frank. I've often wondered about using pallets, since the pallets I've had (not used for gardening) always rot out. I imagine using them outside for gardening would mean they would do the same eventually.